← Island of coconuts and raccoons. Yes,I know, it’s been a while since we have posted to this blog. My apologies. Getting into this retirement thing has been a lot easier than I thought it would be. Rising at the break of day, making coffee in a french press, drinking french vanilla flavored coffee while watching the sun rise above the palm trees on the island we are anchored near, makes for one lazy day after the next. Paradise. Don’t get me wrong, it’s not always this quiet. There are still the ever-present boat chores. Boat parts must be maintained, food and water must be replenished, and upgrades are always in the works. Recently we added a freezer to the boat’s compliment of appliances. This necessitated finding a secure place to keep it, and then upgrading it so that it is more energy-efficient. (Always a good idea when ones energy is limited). Adding a new energy muncher then required either running a generator or the engine battery charging system to recover the energy used during the “dark” hours when our solar battery charging system is doing nothing. This, of course, meant we needed more solar input if we wanted to catch up the energy lost overnight without having to use up our fuel reserves. This is how boat upgrade projects are born. If anyone is interested in more details about boat projects, just drop us a note or shoot us a question, we will be happy to try to fill in the blanks. OK – on to the subject of this post, another visitor. A couple of days ago, I was in the galley fixing myself another delicious cup of the aforementioned coffee, when looking up, what did my eyes perceive? 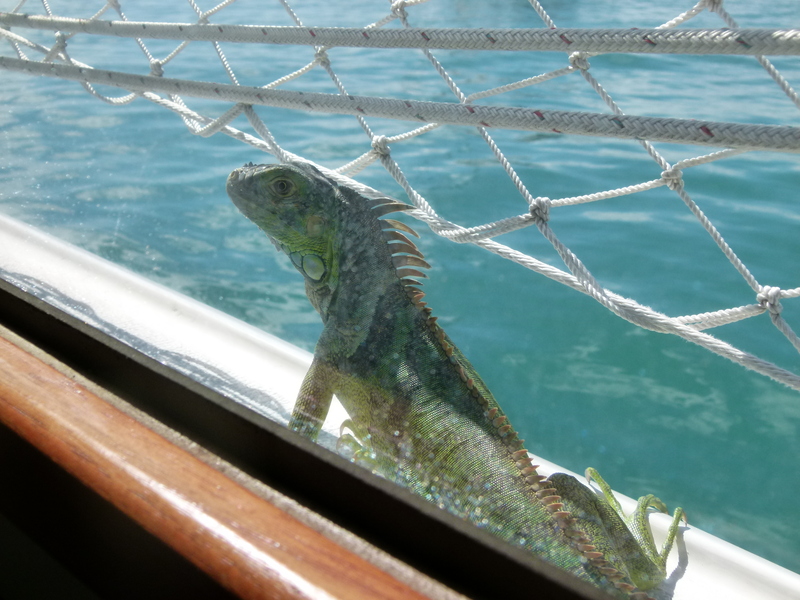 Another visitor to the boat. You can imagine my surprise. 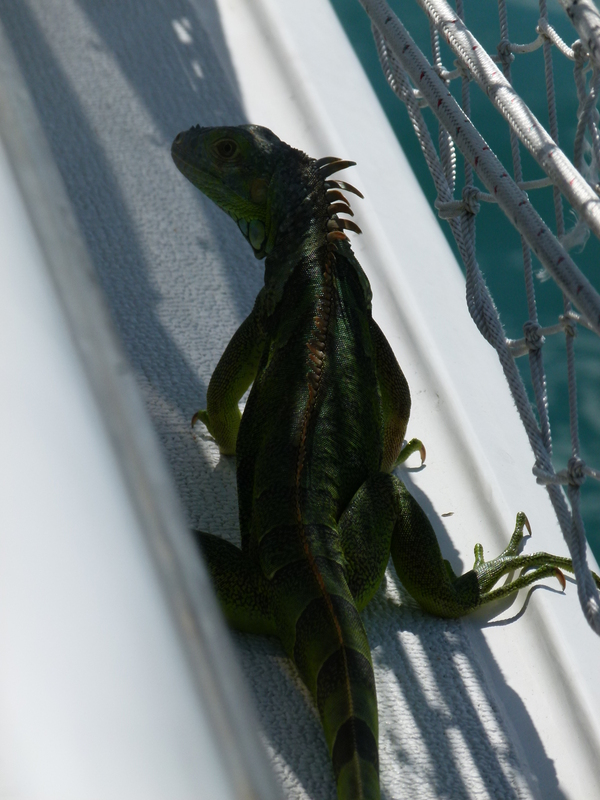 We where at anchor, a good two hundred feet from shore, and here was this six-foot monster sunbathing on the side deck!! I stepped outside with the camera. Proceeded to chase the bugger up to the fore deck. 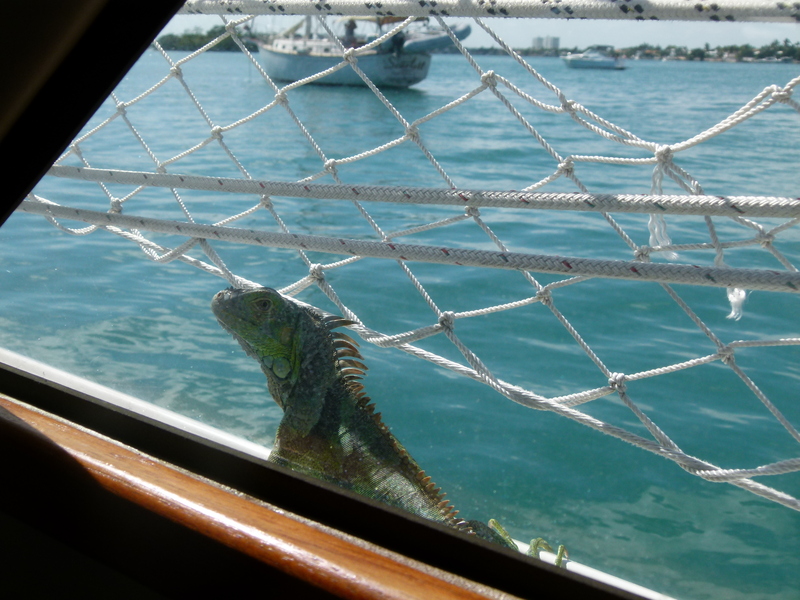 I didn’t know iguanas where such good swimmers! Anyway, that was the adventure de jure. Enough for today. Will try to post more often in the future, if I can just find the time (wink, wink). Thinking pretty seriously about making the jump over to the Bahamas. Maybe…. just one more boat project…. You guys are living the life congratulations.